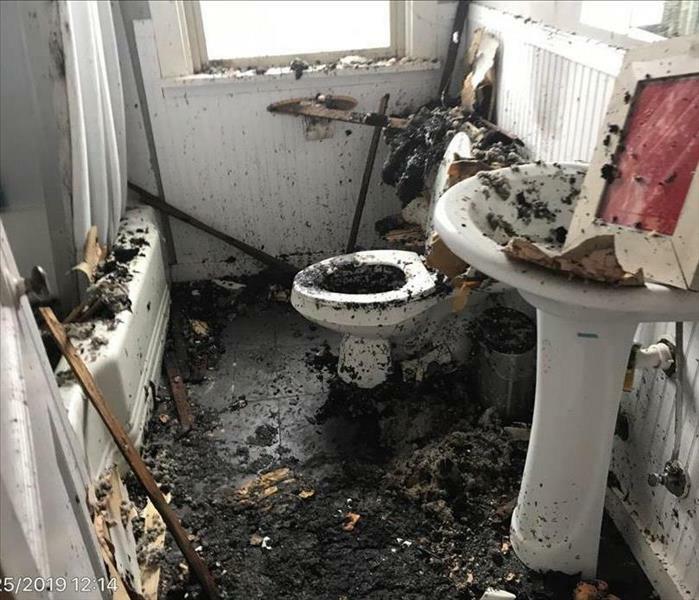 A bathroom ceiling fan was the source of a fire that affected this White Salmon, Wa. home. The bathroom was heavily affected, and the rest of the home suffered varying degrees of damage. SERVPRO of East Clackamas, Hood River & Wasco Counties was called in to help the homeowner begin the process of recovery. Often times, when a structure experiences a fire, the resulting water damage can be just as damaging over time. 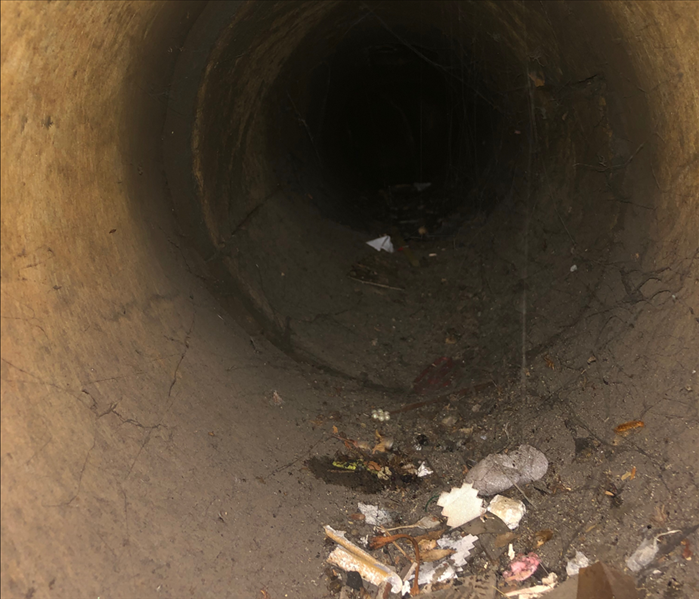 When soot, ash and charred materials mix with water, the resulting "slurry" can become very acidic, quickly causing damage to different materials in a home. Because of this, speed of mitigation can be a key component in salvaging the contents and materials. SERVPRO of East Clackamas, Hood River & Wasco Counties is proud to be locally owned and operated, and our technicians utilize the latest state of the art equipment, and receive industry leading training. Fire Damages Restaurant in The Dalles, OR. 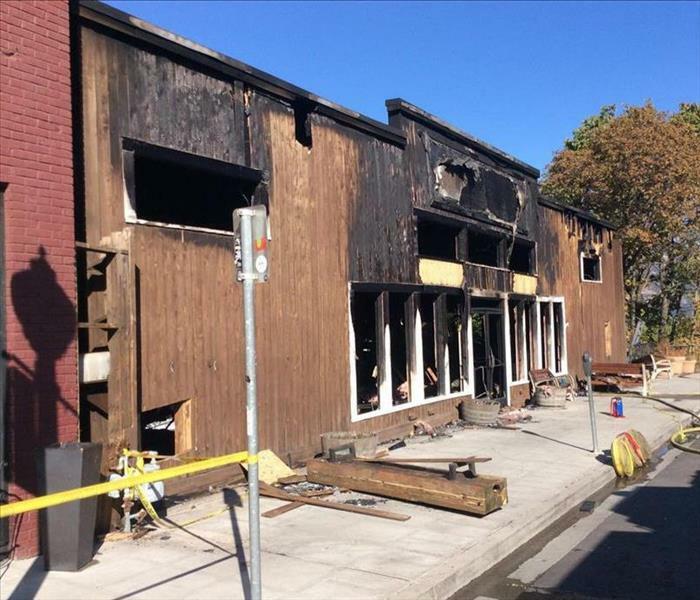 SERVPRO of East Clackamas, Hood River & Wasco Counties was able to help this restaurant after an unfortunate fire in The Dalles, OR. SERVPRO was originally contacted by the neighboring business who suffered a water loss from the fire fighting efforts, as the resulting water migrated under and through the adjoining walls into their business, affecting flooring, carpet, walls, and contents. The professionals at SERVPRO of East Clackamas, Hood River & Wasco Counties have the equipment and resources to manage multiple projects at once, and can respond to your home or business 24/7/365. This Ice Dam in Parkdale Oregon is a classic example of what can happen if heat from a home escapes through an attic, melting snow and causing the water to run down the slope of the roof, until it reaches the overhang of the soffit, where the cold air underneath causes the water to freeze again. SERVPRO of East Clackamas, Hood River & Wasco Counties reminds home and business owners to take preventative measures, and keep a close eye on your roof and gutters, before disaster strikes. Did you know SERVPRO of East Clackamas, Hood River & Wasco Counties performs a variety of non-emergency services? Many of our customers are surprised to learn that just because there is a SERVPRO vehicle at a location, there is not necessarily an emergency. One of the popular services the local professionals at SERVPRO perform is Commercial (and residential) Duct Cleaning. When is the last time you thought about the indoor air quality of your building or facility? 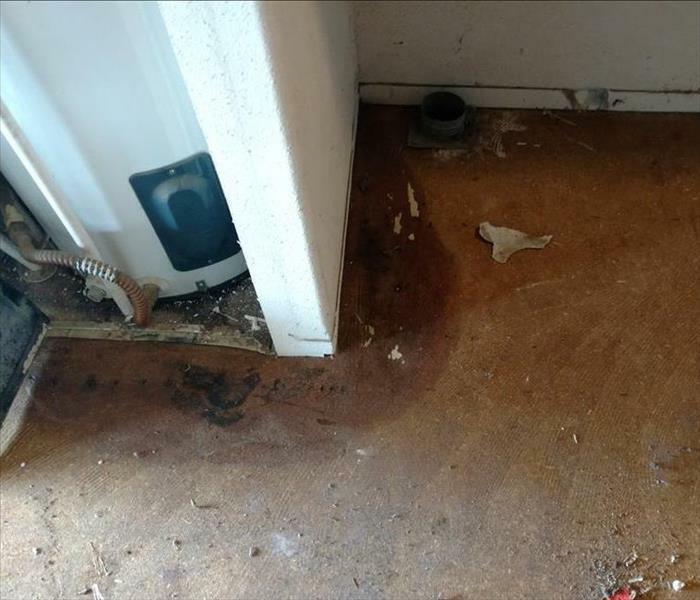 When faced with the aftermath of a water damage, often times our customers will tell us, "it feels dry". While this may be the case, its usually the water you cant see of feel that causes the most damage. Fortunately, SERVPRO of East Clackamas, Hood River & Wasco Counties has the industry leading training to put technology to use. The "Protimeter Aquant Pinless Moisture Meter" in this picture is one example of the equipment the professionals at SERVPRO have the training to use. It can detect and quantify moisture underneath and behind surfaces, to ensure your home or business is properly and thoroughly dried to a preloss condition. SERVPRO of East Clackamas, Hood River & Wasco Counties employees live and work in the communities we proudly serve, and we all enjoy the times when we can show our community spirit. The SERVPRO staff and their families enjoyed the time spent at the Skamania County Fair Parade, while also supporting "Life Skills of Oregon", whose motto is "Learning to Live, Learning to Love"
SERVPRO of East Clackamas, Hood River & Wasco Counties understands that there is no such thing as a convenient time to have a water damage in your home of business. 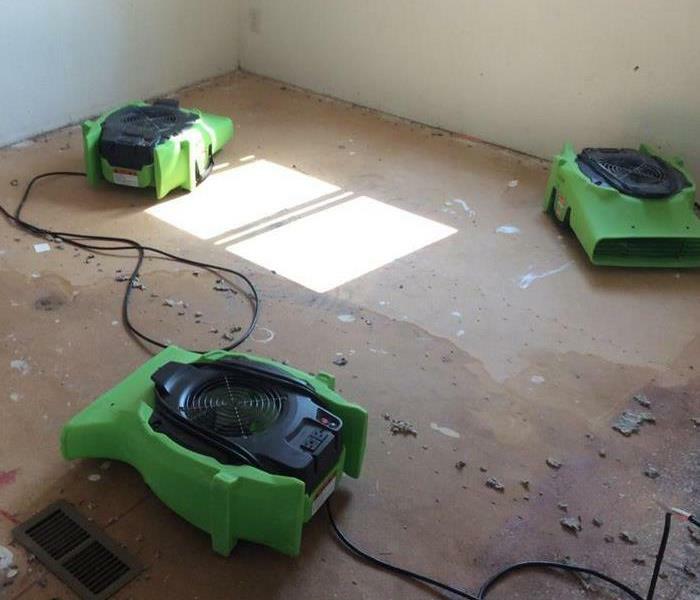 The local professionals at SERVPRO can utilize procedures to help speed the recovery from a water damage. 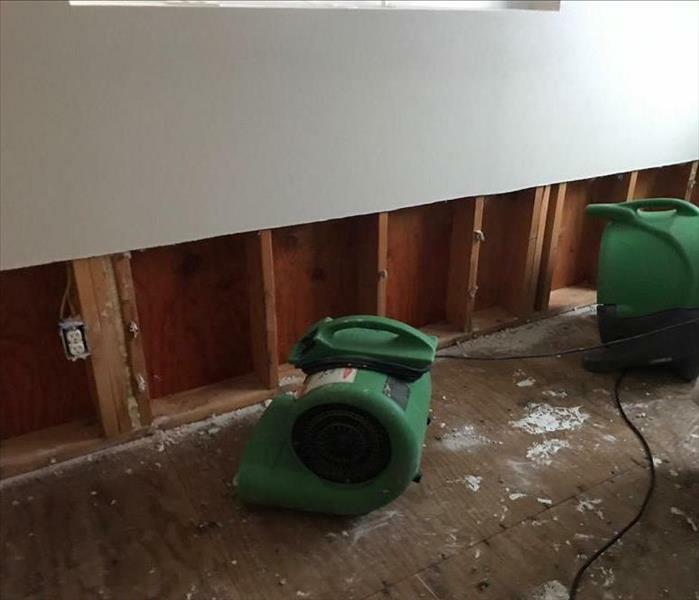 In this instance, SERVPRO performed a "Flood Cut" to open the lower portions of the affected drywall, in order to speed the drying process. 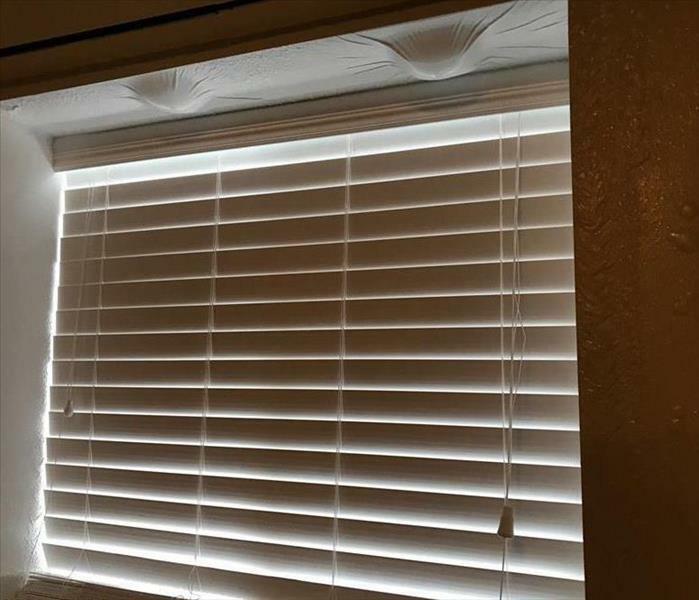 In addition, the "Flood Cuts" are performed at exact heights (such as 2 feet), in order to make the drywall installation faster, and the matching of texture and paint seamless. No matter the need, at SERVPRO, we're always here to help! From winter wind and ice storms, to summer thunderstorms, water intrusion can manifest itself in many ways. As water finds the path of least resistance, it can build up behind painted surfaces, because it acts as a flexible barrier. SERVPRO of East Clackamas, Hood River & Wasco Counties has the expertise and equipment to thoroughly inspect the entire structure, to completely "map" the path the moisture has traveled, in order to correctly dry all the affected components of your residential of commercial structure. 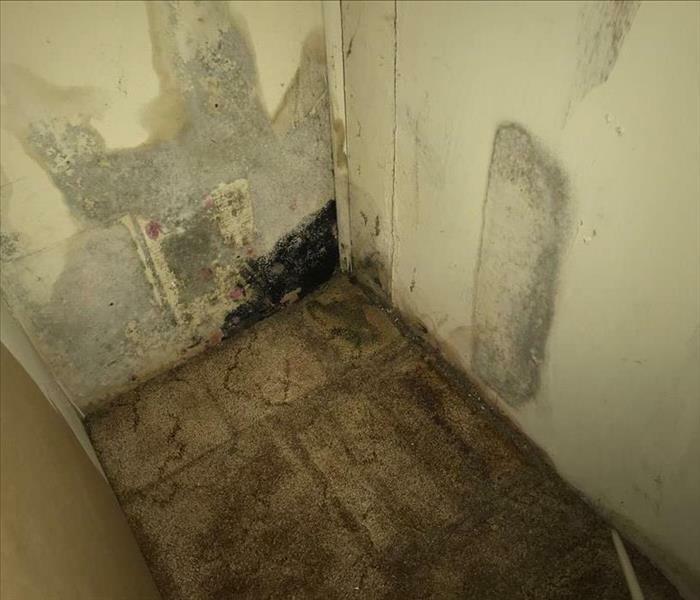 Without a complete drying process, undiscovered mold growth could be a future concern. You can count on the professionals at SERVPRO to put their industry leading training to use for you, to make it "Like it never even happened." 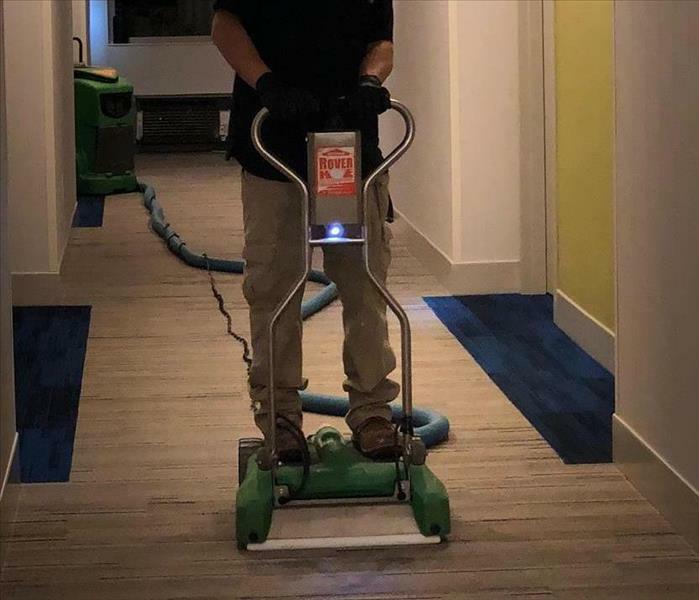 SERVPRO of East Clackamas, Hood River & Wasco Counties was contacted by a local property management firm after a water damage to a vacant unit. 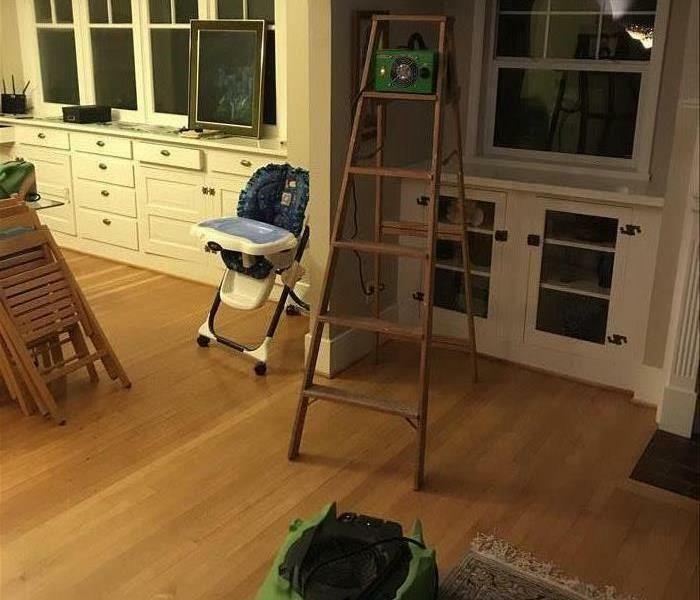 The local SERVPRO professionals were quickly on the scene and deployed "Rescue Mats" - that concentrate vacuum directly on the flooring surface, drawing the water out through the channels in and under the flooring. 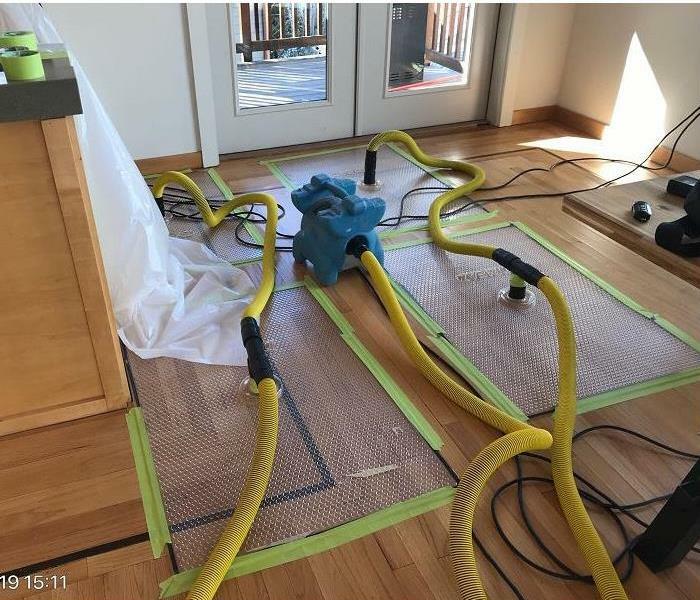 This also protects the finish of the flooring, unlike conventional "wand extraction" or "truck mount extraction" used by many water mitigation contractors or carpet cleaning companies. Mold can begin to colonize and grow in as little as 24-48 hours, given the right conditions. Mold spores need a food source, moisture, and the proper temperature to colonize. Mold will thrive under these conditions, especially if it is shielded from ultraviolet light, as was the case in this basement bedroom. You can trust the certified professionals at SERVPRO of East Clackamas, Hood River & Wasco Counties to safely remediate any size mold problem, residential or commercial - We're always here to help! Mold Growth Around HVAC System in White Salmon Wa. Did you know that condensation can occur on the outside of the ducting of your heating system? This develops when the warm, humid air in your furnace or heat pump interacts with the cold surface of the ducting, leading to condensation on the outside surface. If dust or debris is present, mold growth can occur. Did you also know SERVPRO of East Clackamas, Hood River & Wasco Counties is certified in duct cleaning, and can also help your indoor air quality by cleaning the inside of your duct system? Call SERVPRO anytime - were always here to help! Even this leather couch was the victim of mold after a water loss in an unoccupied home. Mold spores are everywhere, and they grow on any organic surface, given the right conditions. (Even leather) For growth, they require organic matter for food, moisture, warmth, and oxygen. To prevent mold growth, keep all surfaces clean and dry, and provide plenty of ventilation. 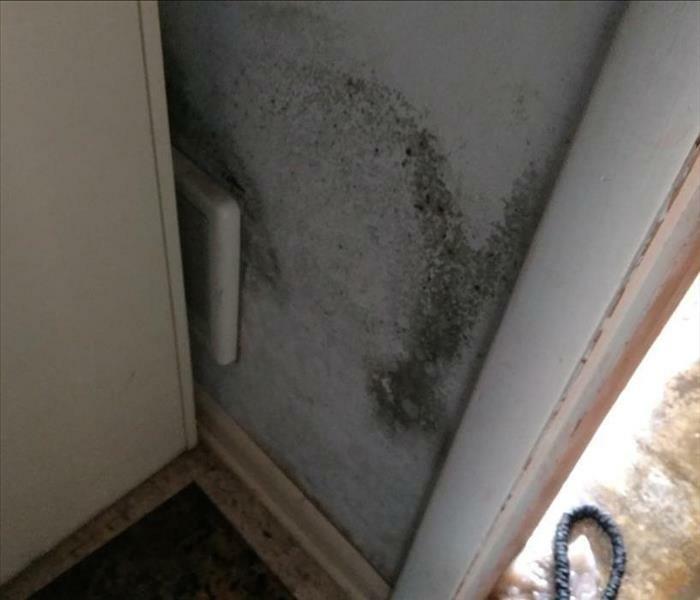 If you have, or suspect you have a mold or moisture problem, Call the experts at SERVPRO of East Clackamas, Hood River & Wasco Counties. If a hot water heater has a slow leak, it can often go unnoticed for extended periods of time. With that moisture, warmth, and a food source (drywall and wood are excellent examples), mold colonies can begin to thrive. This utility closet in The Dalles is a prime example of why it's important to check your appliances often. If you do find a water or mold problem, SERVPRO of East Clackamas, Hood River & Wasco Counties is always here to help! 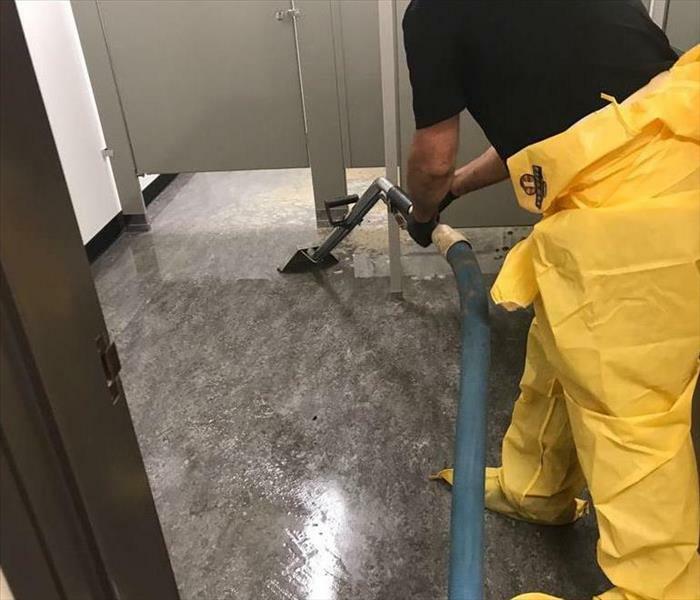 SERVPRO of East Clackamas, Hood River & Wasco Counties was quick to respond to this Business when a heavy rain storm caused a storm drain to back up into the public restroom. The local professionals at SERVPRO understand that time is money, and when your business is affected, you need help immediately. Our local crews are proud of the service they provide - after all we are part of the communities we serve. If your business is in need of service, give the local Columbia Gorge professionals at SERVPRO a call - 24/7/365. 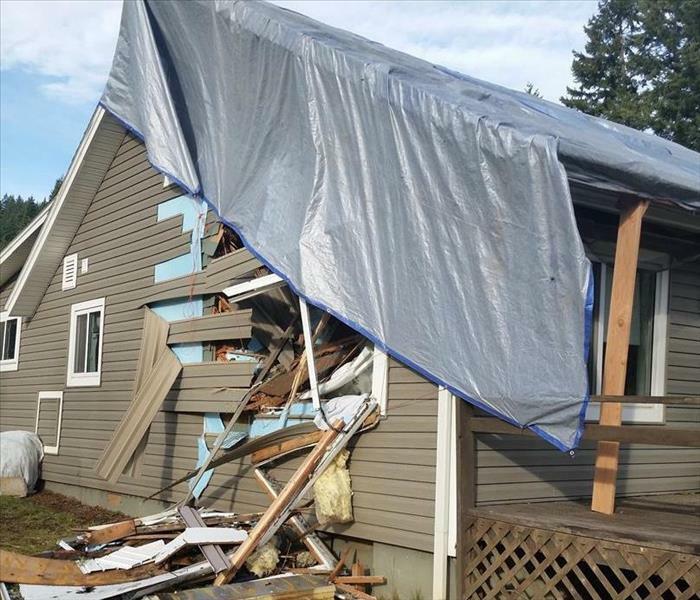 After an unusually severe wind storm this Parkdale, Oregon home suffered a tree strike that cleaved off the front side of the home. Thankfully no one was injured. SERVPRO of East Clackamas, Hood River & Wasco Counties was quickly on the scene to provide temporary tarp and board up services. When disaster strikes, services are needed immediately, and the local professionals at SERVPRO are the trusted choice of local Columbia River Gorge residents and businesses alike. If you need help right away, call SERVPRO! 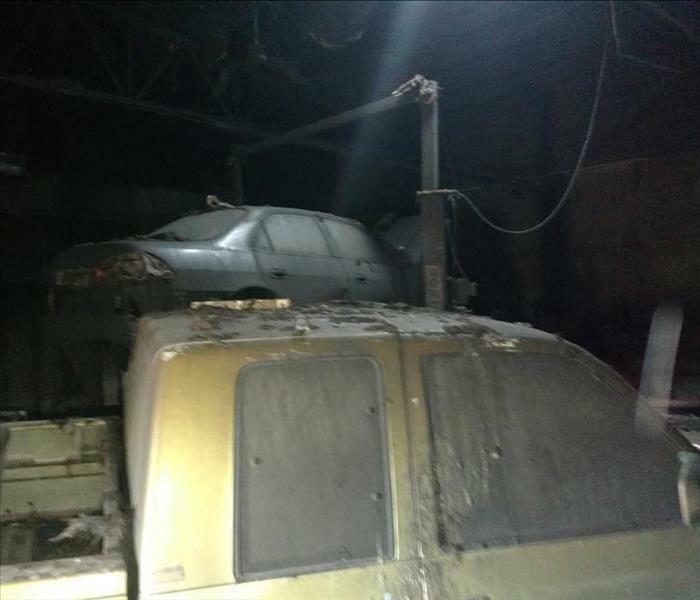 An Auto Repair Business in The Dalles, Oregon was the scene of a fast moving fire. With all the flammable liquids and hazardous materials, its a wonder the fire did not fully destroy the building entirely. 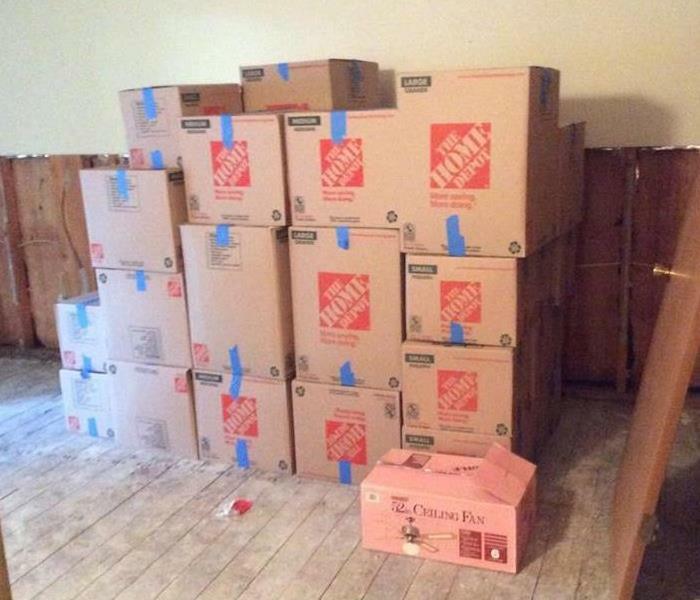 SERVPRO of East Clackamas, Hood River, & Wasco Counties was the right choice for the removal and salvaging of the remaining contents in the adjacent tenants business. It was important for the customer to have an accurate accounting of all the contents, salvageable and destroyed alike. SERVPRO's Professional Technicians have the skills and processes to facilitate this type of service for any client, large or small. When a small basement fire in this Hood River, Oregon farmhouse circulated smoke through the central heating system, it created a large amount of smoke and soot damage. The Certified Professionals at SERVPRO of East Clackamas, Hood River and Wasco Counties are specialists in just this kind of a situation. SERVPRO is trained and equipped to determine if the clothing and textiles are able to be restored, and facilitate the timely removal, processing, and return of your clothing. Special care is taken to store any items off site while restoration is being carried out, or delivered to alternative housing if need be. At SERVPRO of East Clackamas, Hood River and Wasco Counties, were always here to help, 24/7/365. 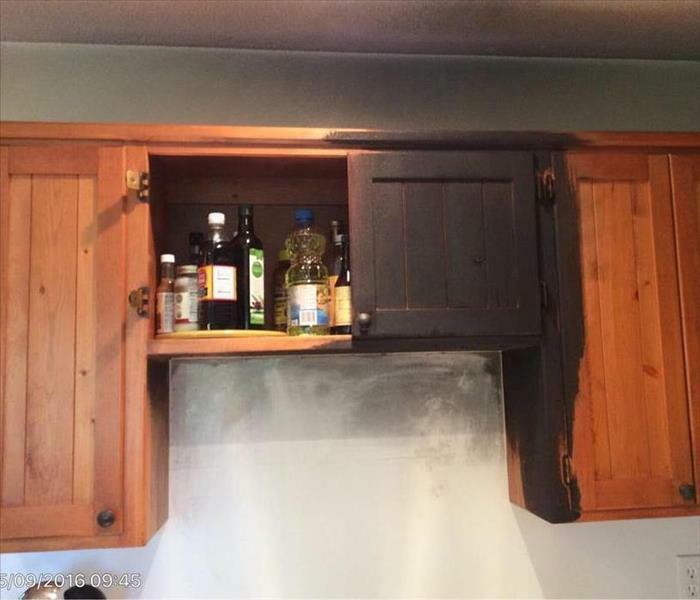 Unattended cooking fires are one of the leading causes of home fire catastrophes. This Kitchen fire thankfully only caused structural damage to the cabinets in the kitchen, but the smoke heavily affected the entire house. Some types of food such as proteins (a prime example is hard boiled eggs) can create heavily pungent, long lasting odors. To make matters worse, the smoke typically leaves a clear film on every surface it comes into contact with. Fortunately, SERVPRO of East Clackamas, Hood River and Wasco Counties has the state of the art equipment and professional training to completely mitigate and restore these types of fires. For more information, please contact us at 541-386-2288. Fires can be devastating events. SERVPRO of East Clackamas, Hood River and Wasco Counties is available to help no mater the size of the loss. This Hood River, Oregon outdoor sports retailer suffered a virtual total loss. 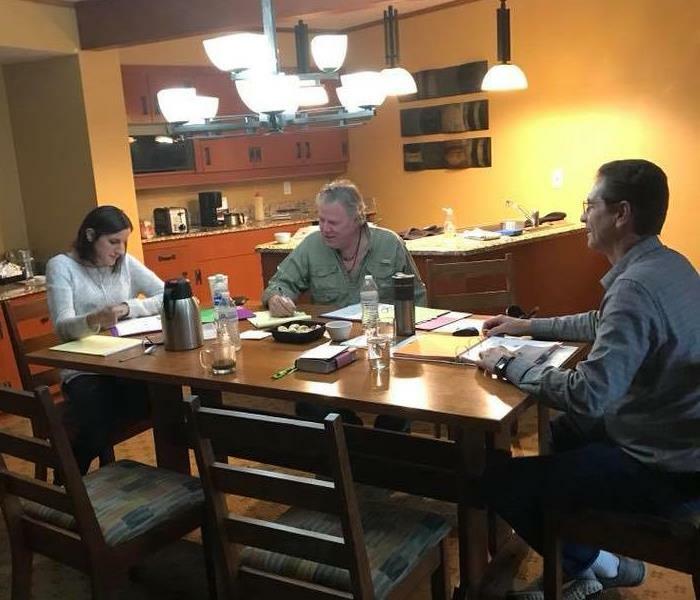 Even though the business had little need for SERVPRO's services, the professional team from SERVPRO of East Clackamas, Hood River and Wasco Counties were there to help neighboring businesses with smoke mitigation and deodorizing. From a large commercial loss to incidental clean-up, SERVPRO is always ready to help. When water damage strikes - SERVPRO of East Clackamas, Hood River & Wasco Counties is ready to help no matter the size of the damage. 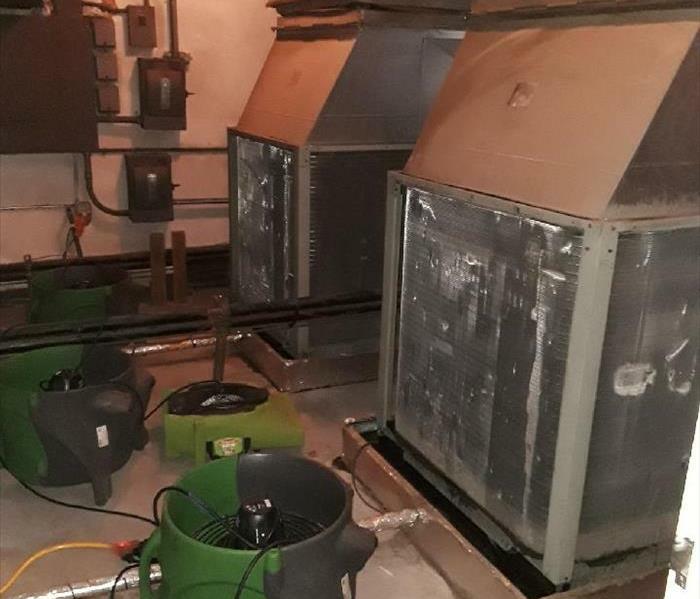 This commercial manufacturing facility suffered an over head water damage, affecting several levels and different offices. The Property Manager was thrilled with the fast response from the local SERVPRO professionals, who made it possible to save the drywall before permanent damage occurred - Dramatically shortening the time the businesses were affected. SERVPRO of East Clackamas, Hood River, & Wasco Counties understands that when storms strike, you need help right away. The professionals at SERVPRO are available to stabilize structures from any event, including ice, water, wind, and even falling trees. 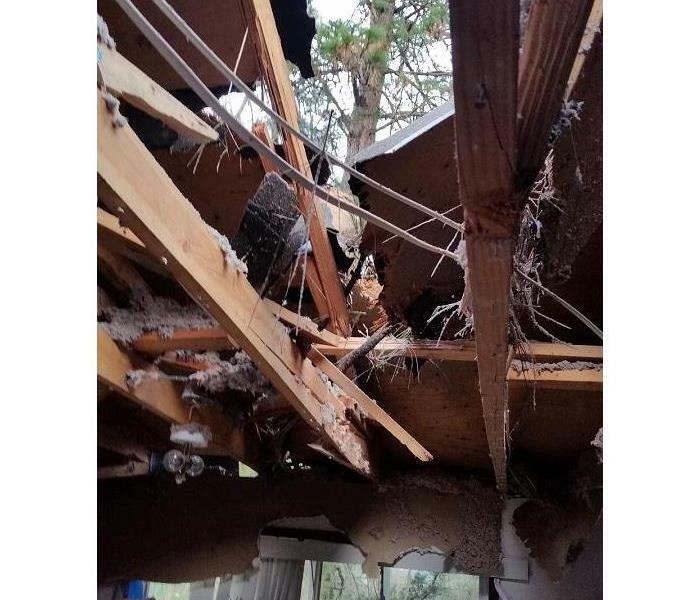 This Hood River, OR apartment complex suffered a tree strike, and SERVPRO was on the scene in a moments notice to cover the roof and remove the water and debris from the interior before it affected any of the adjoining units. When winter storms move through the Columbia River Gorge, you can count on SERVPRO of East Clackamas, Hood River, & Wasco Counties to be there to get your business up and running as quickly as possible. This commercial space in The Dalles, OR, suffered a water intrusion event due to winter weather, and needed water extracted immediately before it affected their offices and public space below. SERVPRO is available 24/7/365 to help in any situation, and has the resources to handle any size disaster, from residential to commercial. SERVPRO of East Clackamas, Hood River and Wasco Counties successfully deodorized this structure using our Commercial Grade Ozone Generators. The Ozone generator is place in a elevated location due to Ozone being a gas that is heavier than air. Air movers are often used in conjunction to thoroughly circulate the Ozone throughout a structure. Ozone (O3) is a highly reactive molecule and is very quick to chemically react with particles that it comes into contact with in the air and on surfaces. The extra oxygen atom in the ozone attaches itself to other molecules, chemically changing their structure to create non-offensive molecules – eliminating the smell. To learn more about deodorization options for your home or business, contact SERVPRO of East Clackamas, Hood River and Wasco Counties today! Did you know that no matter how large the disaster, SERVPRO of East Clackamas, Hood River and Wasco Counties is always ready to "Make it Like it Never Even Happened"? 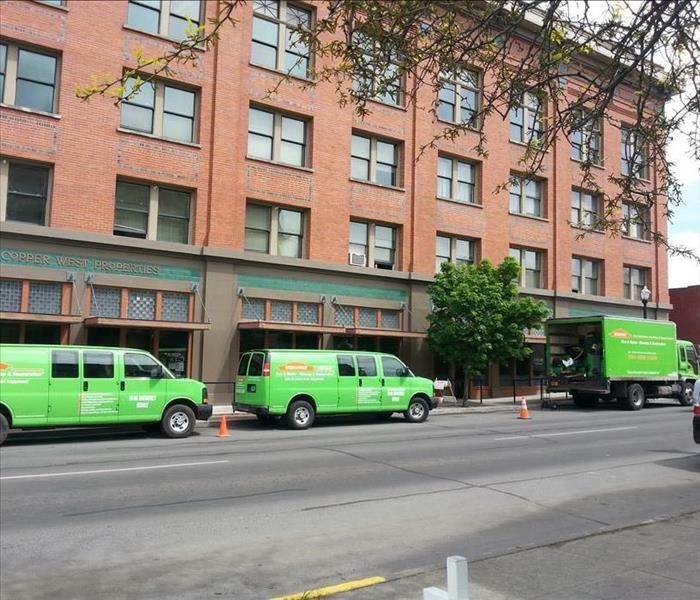 Commercial property owners and managers alike throughout the Columbia River Gorge can count on the local professionals at SERVPRO to be ready no matter how large the challenge is -24 hours a day, 7 days a week! This property in The Dalles, OR, suffered a water loss on the 4th floor, affecting all the levels below, and disrupting several businesses. 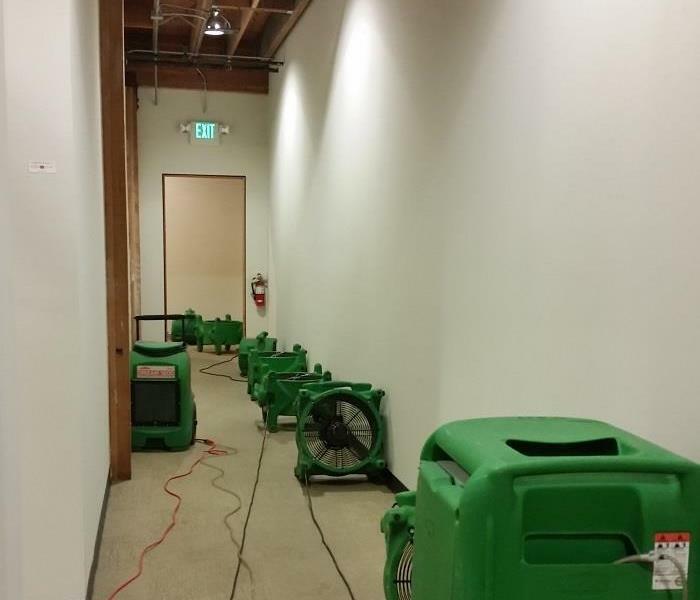 The Property Manager knew that SERVPRO of East Clackamas, Hood River and Wasco Counties has the resources to quickly mitigate a water damage of this size, and manage the entire project from start to finish. At SERVPRO, we understand the urgency when a business disruption occurs, and are proud to be a trusted partner in the Columbia River Gorge business community. When wildfires strike, they can change lives in a moment. SERVPRO of East Clackamas, Hood River and Wasco Counties understands the trauma that comes with property destruction. At SERVPRO, were a part of the communities in the Columbia River Gorge - we live and work here, we raise our families and care for our property in the Gorge alongside our neighbors as well. When another destructive fire season struck this summer, SERVPRO was actively in the field, responding to our customers needs - often working alongside homeowners as active fires were still present in the area. From cleaning smoke and soot damage, to contents restoration and structural rebuild capabilities, at SERVPRO of East Clackamas, Hood River and Wasco Counties, were proud to be the trusted choice of residents and business owners in the Columbia Gorge area. SERVPRO understands the damage a leaking hot water heater can do to your home or business. This leaky hot water heater was not discovered until the homeowner noticed a musty smell and damp carpet several rooms away from the hot water heater. 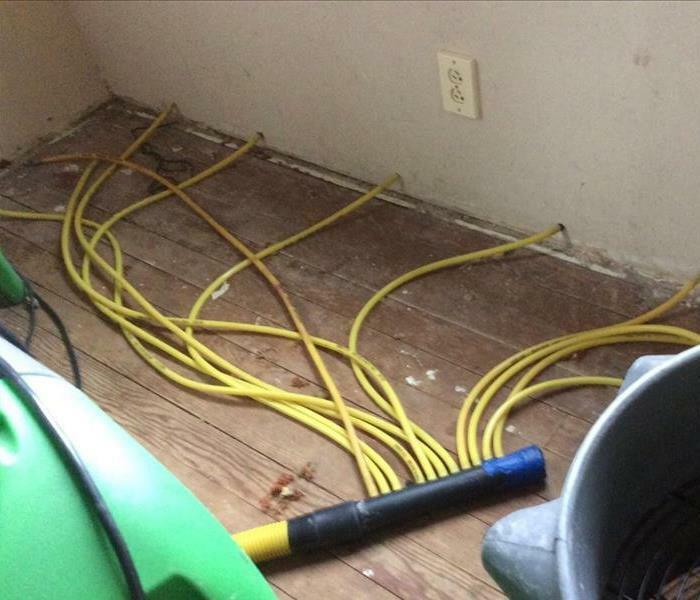 SERVPRO of East Clackamas, Hood River and Wasco Counties quickly identified the source of the wet carpet, and immediately mitigated the damaged carpet and padding. The homeowners sub floor was able to be dried without removal, and an antimicrobial product was applied to control mold growth. The professionally trained technicians from SERVPRO were able to have this customers home in The Dalles, Oregon completely dried in time for the new water heater and carpet to be installed. The homeowner was thrilled that the situation was able to be managed and coordinated so seamlessly from start to finish by SERVPRO. Another piece of our specialty equipment, "The Rover" is being used in this Hood River, OR hotel to quickly extract water in a hallway from a broken overhead water pipe. The Rover is designed for a technician to stand on it while operating, to increase the amount of water that can be extracted from the carpet, and even the pad underneath! This special equipment is called an Injection Dryer. It is used to dry the installation inside the wall. We remove the baseboards and drill holes. We then insert the hoses from the injection dryer into the wall to start drying. In this case, it was being used because a waterbed leaked through the flooring on the second story and into the walls on the first floor. For this water loss job, SERVPRO of EAST CLACKAMAS, HOOD RIVER AND WASCO COUNTIES had to do a pack out to our shop. This was a water loss due to a failed toilet seal. We had to pack up this customers contents and have it properly cleaned and dried. Air Movers drying out a room due to a water loss in the crawl space. Air movers (aka “industrial air blowers”, “commercial blower fans” or “floor drying fans”) are used in construction and water restoration projects, having a wide variety of industrial applications. Their primarily used to increase air circulation, which speeds up water evaporation and reduces drying time. Compressed air is also used to maximize airflow in a blower fan or air mover. Hence why the air movers are set up in a circular motion here in this picture. SERVPRO of East Clackamas, Hood River & Wasco Counties took a weekend in the Columbia Gorge at The Skamania Lodge resort in Stevenson, WA in November of 2017. Each year, the SERVPRO management team gathers for strategic planning. In planning ahead for the coming year, SERVPRO strives to find ways we can better serve our customers in their times of need. Whether assuring our teams are supplied with the latest industry leading equipment to planning training sessions and educational opportunities, SERVPRO of East Clackamas, Hood River and Wasco Counties is thankful for the opportunity to serve our residential and business customers to the best of our abilities. 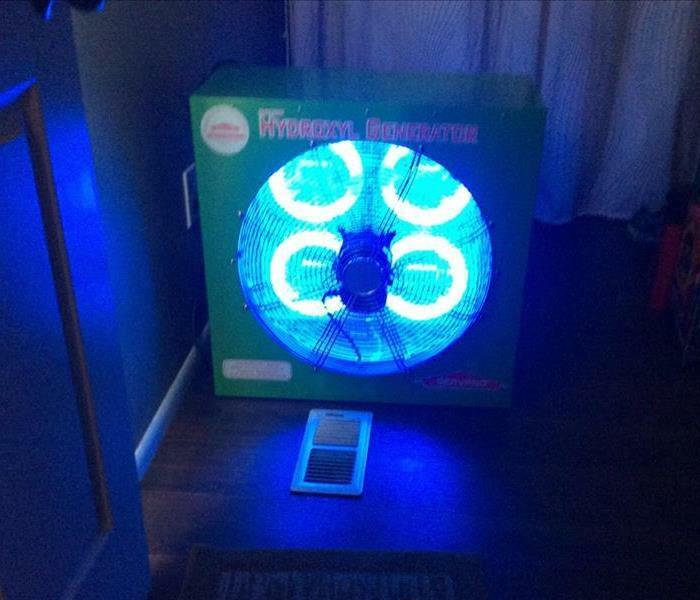 The Hydroxyl Generator is a revolutionary device that generates “superior hydroxyls” that eliminate bacteria, mildew, mold, noxious gases, odors and volatile organic compounds (VOCs) in indoor environments. This special generator was used in a Odell, Oregon home where a sewage back up was caused by a failed line. Specialty Equipment - "The Dragon"
"The Dragon" is part of our specialty equipment. It's a portable furnace that can be used to dry areas like a crawl space, or a large warehouse. 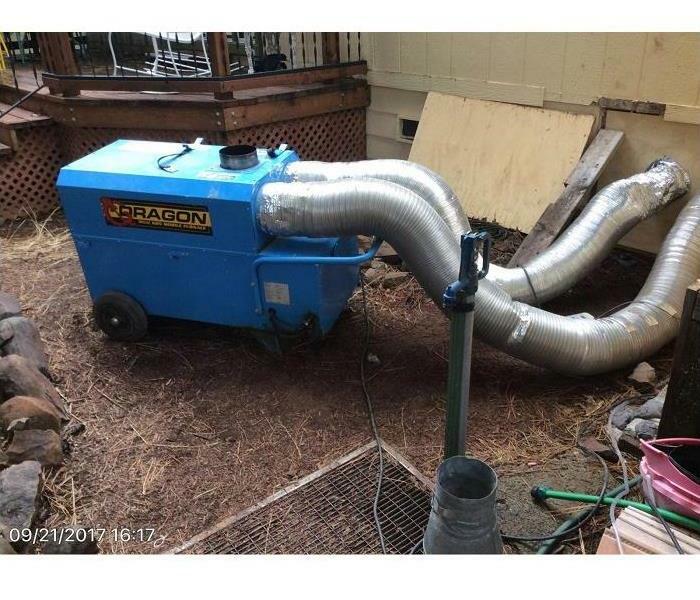 The Dragon was being used here at a home in Cascade Locks, OR, due to the customer having a water loss that saturated most of the crawl space. The area was quickly heated, speeding up the drying process.